Faced with 30 or 35 students looking at you expectantly in the classroom every day, do you sometimes wonder if you’re even getting through? Try driving your classroom instruction with formative assessment, an exciting teaching tool that gives you instant feedback on whether your students are learning—which enables them to learn better. If teachers and students can find out immediately whether a student has grasped a concept, they can make corrections, if needed, and build on the acquired knowledge to move on to the next level of learning. This instant feedback, designed to promote students’ learning in a way that allows learning activities to be altered according to results, is called formative assessment. It’s different from summative assessment, which measures mastery. It helps teachers figure out which students understand the teaching point of a lesson, which have mastered a new concept, and which need extra help. Because research shows that formative assessment helps students achieve more progress for less money than other efforts such as smaller class sizes and teacher training, according to the National Council of Teachers in Mathematics. Because when formative assessment is used in short and medium cycles, teachers reported greater professional satisfaction and increased student engagement. A teacher who uses formative assessment is a teacher who really listens, who really tunes in to her students, and who gets results. Is that you? It can be. Students learn better if they get instant feedback, especially when they’re striving to understand complicated mathematical concepts. That’s why Curriki, with AT&T, has developed tools educators can use to create interactive math assessments that help students catch their mistakes right away so they can get right to work on improving them. In September and October, we discussed Pre-Algebra and Algebra 1 assessments in this blog. Today we will focus on how these new tools help students learn Geometry. Unit 1 – Congruence, Proof, and Constructions talks about experimenting with transformations in the plane, understanding congruence in terms of rigid motions, proving geometric theorems and making geometric constructions. Unit 2 – Similarity, Proof, and Trigonometry covers similarities, including transformations, proving theorems, defining trigonometric ratios and solving problems involving right triangles. Unit 3 – Extending to Three Dimensions explains volume formulas and how use them to solve problems, and visualizes the relationship between two-dimensional and three-dimensional objects. Unit 4 – Connecting Algebra and Geometry through Coordinates uses coordinates to prove simple geometric theorems algebraically and translates between the geometric description and the equation for a conic section. Unit 5 – Circles With and Without Coordinates discusses theorems about circles, especially arcs and areas of sector, translates between the geometric description and the equation for a conic section, and applies geometric concepts in modeling situations. The key advantage is simple: Curriki’s high-quality digital content gives students instant feedback. Students take interactive quizzes that are scored in real time, a level of engagement not available with traditional assessments that they submit to the teacher to be graded later. Students can immediately see where they are, where they are going, and how to get there. Thus, students will gain self-knowledge about their understanding of a topic or how deeply they have mastered a skill. Read about the Pre-Algebra and Algebra 1 collections. AT&T is sponsoring the collections with a $125,000 contribution as part of the company’s investment in preparing students for success in school and careers through AT&T Aspire. AT&T is committed to advancing education, strengthening communities and improving lives. Through its community initiatives, AT&T has a long history of investing in projects that create learning opportunities; promote academic and economic achievement; or address community needs. The company’s signature philanthropic initiative, AT&T Aspire, drives innovation in education to promote student success in school and beyond. With a financial commitment of $400 million since 2008, AT&T is leveraging technology, relationships and social innovation to help all students make their biggest dreams a reality. Curriki is thrilled to be part of that! 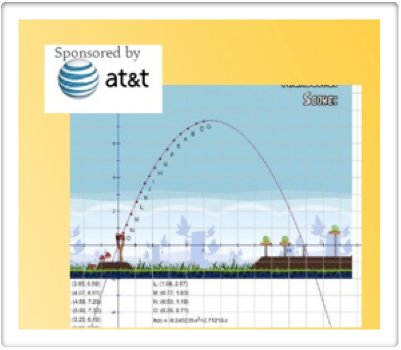 As we shared last month, Curriki has teamed up with AT&T to develop tools educators can use to create interactive math assessments that give students instant feedback. We are doing this because we believes that new content resources and technology promote student achievement while giving students truly engaging learning experiences. We think this will help students learn because they catch their mistakes and weaknesses right away and can get to work on improving them. AT&T’s high-quality digital content for teaching and learning gives instant feedback. They take interactive quizzes that are scored in real time, providing a level of engagement not available with traditional assessments submitted to the teacher to be graded later. Students can immediately see where they are, where they are going, and how to get there. Thus, students will gain self-knowledge about their understanding of a topic or how deeply they have mastered a skill. Last month we focused on what would be covered in the Pre-Algebra collection and assessment. This month we take a look at Algebra 1. Relationships Between Quantities and Reasoning with Equations, which includes reasoning quantitatively and using units to solve problems, interpreting the structure of expressions, create equations that describe numbers or relationships, and solving equations. Linear and Exponential Relationships, which includes extending the properties of exponents to rational exponents, solving systems of equations, solving equations and inequalities graphically, understanding the concept of a function (including interpreting, analyzing and building), and constructing and comparing linear, quadratic, and exponential models to solve problems. Expressions and Equations, which includes interpreting the structure of expressions and writing them in equivalent forms to solve problems, performing arithmetic operations on polynomials, creating equations that describe numbers or relationships, and solving equations and inequalities in one variable and in systems. Quadratic Functions and Modeling, which includes using properties of rational and irrational numbers, interpreting functions that arise in applications, analyzing functions using different representations, building a function that models a relationship between two quantities, building new functions from existing functions, and constructing and comparing linear, quadratic, and exponential models. Curriki has teamed up with AT&T to develop tools enabling educators to create interactive math assessments that give students real-time feedback. We think these new content resources and technology will promote student achievement while giving students truly engaging learning experiences. AT&T is providing high-quality digital content for teaching and learning that provides the ability to give students what they often don’t get in school: instant feedback. Interactive quizzes scored in real time give students a level of engagement not available with traditional assessments submitted to the teacher to be graded later — students can immediately see where they are, where they are going, and how to get there. Students will gain self-knowledge about their understanding of a topic or how deeply they have mastered a skill. This month we’ll talk in detail about the Pre-Algebra Collection, and cover the other two in upcoming months. The Pre-Algebra Collection focuses on the Number System, including a full understanding of rational and irrational numbers. The section on Expressions and Equations helps students learn about the connections between proportional relationships, lines, and linear equations, and covers integer exponents, square root and cube root systems, estimating very large or small quantities, slope, real-world problem solving and more. Functions helps students define, evaluate, and compare functions and use them to model relationships between quantities. Find out what the most popular STEM (science, technology, engineering, math) Curriki resources are by checking out this top 10 list. Remember, all of these resources are free and you can customize them to fit your needs. For more Curated Collections, visit Curriki. Evolution of Earth – 6-week high school unit where students learn about the evolution of earth, its formation, features, and changes over time. 2. FHSST Chemistry textbook – contains a total of 23 chapters to be used in grades 10 through 12. 3. Getting Started With Java Using Alice – students with little or no programming experience can learn basic Java programming concepts to create animated stories, movies and games. 4. Algebra 1 – this collection consists of an entire Algebra I course of videos created by Salman Khan for the Khan Academy. 5. Math Lessons, Activities, and Problems – organized by subject (trigonometry, algebra, calculus, statistics, and more) for grades 6-12. 6. Curriki Geometry – this course offers six complete projects; all the projects are designed in a project-based learning (PBL) format. 7. Coordinate Graphing – a fun game that helps with coordinate points in the four different quadrants. 8. Systems of the Human Body – includes worksheets on the systems of the human body. 9. Chemistry, Grades 10-12, Matter and Materials – this resource is part of the FHSST Chemistry collection and contains 10 chapters. 10. Geometry Bingo – a bingo game involving visuals to help students learn and identify key vocabulary for geometry at the 5 th and 6th grade levels. Know a fellow STEM fan? Please pass this valuable list on to him/her. What makes a “math person”? What is it that causes people to pursue majors and careers in math and other STEM disciplines where mathematics is crucial to success? The National Science Foundation has recently supported a study by Professor Zahra Hazari at Florida International University’s STEM Transformation Institute. Professor Hazari worked with colleagues at Harvard University and Western Kentucky University to interview over 9000 college students taking calculus. What they found was that it’s not simply about math competence and confidence. Students reported that they developed interest and positive attitudes toward math, and had received recognition from family, teachers and other students. So they responded positively when asked if they saw themselves as a “math person”. These are good recommendations for all students in math courses, not just those who end up as “math people”. The point here is that both weaker students and the stronger students benefit from encouragement and engagement. Here are 5 excellent sites for free STEM resources. If you know a math teacher or a student who’s interested in math, please tell them about Curriki. Did you know we offer more than 15,000 free online math open educational resources (OERs)? Here are our most popular math resources over the past year. Math for Americas: Lessons, Activities and Problems – designed for middle and high school students, this includes collections of lessons, activities, and problems organized by subject (pre-algebra, trigonometry, calculus, statistics, geometry and more). Curriki Geometry PBL Modules – Curriki Geometry comprises six Common Core State Standards (CCSS)- aligned projects. The projects are available in both PDF format for easy download and in an online course format at www.currikigeometry.org. Division (video) from Khan Academy – This video is an introduction to division: what it means and how to do it. You can find links to many other Khan Academy video resources here. For Students: Project-based Pre-Algebra – This unit is meant to provide supplemental support to a standard Pre-Algebra course and is meant to connect the world of math to that of art. These projects follow the typical sequence of a standard 7th/8th grade Pre-Algebra course. Relationships between Quantities and Reasoning with Equations – By the end of eighth grade, students have learned to solve linear equations in one variable and have applied graphical and algebraic methods to analyze and solve systems of linear equations in two variables. This unit builds on these earlier experiences by asking students to analyze and explain the process of solving an equation. Mathematics – This collection is a full course of material in the form of a textbook provided by FHSST (Free High School Science Texts). FHSST is a project that aims to provide free science and mathematics textbooks for Grades 10 to 12 science learners. Area of a Triangle – This lesson walks students through a classic optimization problem involving building the maximum area of a triangle, expressed in terms of an angle. The lesson uses a worksheet in The Geometers Sketchpad. Curriki Algebra – These modules are based upon the domains and Common Core State Standards clusters. They contain daily lessons based on the four algebra domains and the standards and standard clusters found within. The daily lessons are based on 50-minute sessions and build up to a culminating project-based activity. Math eTextbooks – A collection of free math eTextbooks including algebra, statistics and probability, calculus, geometry and more. Please help us spread the word and share this list with a friend or colleague!